Above photo: Indians at the World Social Forum in Belem Brazil, January 28, 2009, discus the rights of indigenous peoples. Photo by Andre Penner / AP. I waited a couple of days before sit­ting in front of my laptop and try­ing to organ­ize the com­bin­a­tion of feel­ings that had been invad­ing me since I left Tunis and the 2013 World Social Forum. It was my first time, and, as every first exper­i­ence, I had charged it with expect­a­tions, hopes, desires, and curi­os­ity. Forty-eight hours after my depar­ture, when the meet­ing had been offi­cially closed and the atten­tion is now focused on the pos­sib­il­ity that the WSF will have a long term impact over the Tunisian situ­ation, the time has come to col­lect my thoughts, and to say why I do not wish this WSF to become a term of ref­er­ence for the lib­er­a­tion pro­cess that hun­dreds of thou­sands of Tunisi­ans star­ted two years ago. And why I think that ‘Another forum is pos­sible’. Dif­fer­ently from the major­ity of the people that filled the Al Man­ara Cam­pus dur­ing four days, the Tunisian people have occu­pied the streets of their cap­ital, they have put their lives into the struggles, they have fought, suffered, and phys­ic­ally opposed the régime of Ben Ali. They have not writ­ten let­ters or motions, they have not edu­cated people through sem­inars or talks, but they have util­ized num­bers and dis­sent to give a con­crete sig­nal of their dis­sent, of their suf­fer­ing and of their not accept­ing inequal­ity, poverty, cor­rup­tion, and the global mech­an­isms of private accu­mu­la­tion by the dis­pos­ses­sion of the pub­lic. They have been brave and determ­ined, and they have not respon­ded to the requests of donors, fun­ders, sup­port­ers or the media. Their actions channeled a real and per­ceiv­able dis­sent, and their strategy was not at all polit­ic­ally correct. The Tunisi­ans who flooded Tunis and sub­ver­ted the régime do not need the people of the WSF to tell them where to go next: on the con­trary, they have a lot to teach about tech­niques of social change and res­ist­ance, and about the sac­ri­fices that are required when a paradig­matic shift is the object­ive. Moreover, there is no doubt that the revolu­tion has only begun, and its sub­or­din­a­tion under the cat­egor­ies and struc­tures of the insti­tu­tion­al­ized move­ment of anti-globalism—which is rep­res­en­ted by the WSF—could deprive it of its impact and strength, and trans­form it in another eman­cip­at­ory pro­cess which attempts to redefine the sys­tem from within. In my opin­ion, that is not what the Tunisian people need, nor what they are ask­ing for. In the five days that I’ve spent in Tunis, not a lot of time, but enough to talk with people within and without the bound­ar­ies of the World Social Forum, the file rouge of their dis­courses was rep­res­en­ted by the request to under­stand the ongo­ing lie about demo­cracy and demo­cratic trans­form­a­tion, and to sup­port any fur­ther action rather than entrust­ing the cur­rent gov­ern­ment with hopes and legit­im­acy. Des­pite that, on the other side of the gates that sep­ar­ated the world of the World Social Forum from the real world, it was pos­sible to grasp a dif­fuse sense of optim­ism and con­fid­ence around the Tunisian demo­cratic trans­ition, which some nar­rat­ives are already defin­ing with the vocab­u­lary of the state build­ing which is so appre­ci­ated by Fukuyama and the sup­port­ers of the excep­tion­al­ity of West­ern demo­cracy. And that brings me to the second part of this Art­icle, the domest­ic­a­tion of the World Social Forum and its sneaky accept­ance of the dom­in­ant paradigm that it claims to refuse. In par­tic­u­lar, there are at least four ele­ments which sup­port my claim, which do not rep­res­ent a pecu­liar char­ac­ter­istic of the WSF, but the simple trans­pos­i­tion within the WSF of the para­doxes and incon­sist­en­cies which are proper of sev­eral NGOs, not to say of cooper­a­tion itself. a) More than one thou­sand con­fer­ences have been organ­ized, the major­ity of which by inter­na­tional or North-?based NGOs, each one of them based on the tra­di­tional struc­ture of the expert talk­ing about one spe­cific sub­ject, while the rest of the audi­ence, mainly mem­bers of other North NGOs, i.e. white, edu­cated people who vis­ited Tunis for the first time, only had few minutes to ask ques­tions and receive answers, instead of par­ti­cip­at­ing in a col­lect­ive ana­lysis of the issue or an exten­ded con­front­a­tion around the topic. Rather than being a dia­logue between the people of the world, the WSF has appeared as a huge trans­fer of notion and know­ledge from the North to the South, or from the expert to the North to the rest of the pop­u­la­tion, a pro­cess which does not dif­fer from the tech­nique util­ized by the big global act­ors, which respect­fully repro­duces the sub­or­din­a­tion and silen­cing of the dam­nés, if we were to use the term coined by Franz Fanon. b) Not only were the sources of know­ledge pre-selected and repro­duced by that North­ern idea that recog­nizes author­ity only in the expert­ise and that know­ledge equals to edu­ca­tion, but these “experts” were kept phys­ic­ally sep­ar­ated within the cam­pus and from the rest of the world. Leav­ing any logist­ical reas­ons aside (it is clearly not easy to organ­ize one thou­sand events in the middle of a city), who­ever has par­ti­cip­ated in the forum should ask him­self or her­self if a segreg­ated forum is the kind of forum that we want. Do we want a ghetto event that takes place behind the con­trolled gates of a cam­pus? Can we accept that the cam­pus was divided into two parts, one ded­ic­ated to the Maghreb and Arab world, and the other one, the one with the media cen­ter, the major­ity of the classrooms, the tents of the NGOs and three amphi­theat­ers, almost exclus­ively pop­u­lated by inter­na­tional NGOs and non-Tunisian people? Do we want to build a global cen­ter of encounter where it is neces­sary to obtain, pay and show a badge in order to access? Do we want a forum were the par­ti­cipants, the con­fer­ences, the themes, and the ori­ent­a­tion of the debate is already selec­ted by the act­ors who have the resources and the power to par­ti­cip­ate, with very little space for autonom­ous organ­iz­a­tion and spon­tan­eous dynam­ics? Is it a sys­tem of phys­ical and ideo­lo­gical isol­a­tion, fruit of the decisions of a restric­ted group which forms the Inter­na­tional Com­mis­sion, that we want to pro­pose as an altern­at­ive to the dom­in­ant paradigm? Does it or does it not rep­res­ent some­thing new, or it is simply a hid­den form of repro­du­cing know­ledge and neo-colonization. c) Linked to the resource prob­lem, the 2013 WSF, as many for­ums before, has demon­strated how import­ant money is today, included for NGOs who are offi­cially fight­ing and strug­gling against the com­modi­fic­a­tion of life, people and of nature. The choice to organ­ize the meet­ing in Tunis, whether dic­tated by the offi­cial motiv­a­tion to ride the wave of the Arab spring and of the Tunisian revolu­tion, has pro­duced an auto­matic mech­an­ism of selec­tion which at the same time has reduced the num­ber of rep­res­ent­at­ives of the Global South (of the real one, not of fake South coun­tries like Brazil, India and South Africa) and pro­duced a mono­pol­iz­a­tion of the Forum by European and North Amer­ican, included numer­ous French people who prob­ably wanted to see what had happened to their former colony. In the major­ity of the meet­ings organ­ized by non local NGOs, although there were some pos­it­ive excep­tions, noth­ing would have made me think that the forum was tak­ing place in Tunis, nor that it was tak­ing place in Africa. Gen­er­ally held in French or Eng­lish, mainly atten­ded by European, North Amer­ican, and some BRICS’ people, the events were extra­pol­ated from the sur­round­ing real­ity both as to the con­text and as to the con­tent, as it was not import­ant where we were and why we were there. Although it is not easy to provide a solu­tion to the resource curse that affects the non-governmental world, there is little doubt that the short­cut of private fund­ing can­not be accep­ted. And that takes me to my final point. d) On the first day of the forum, while the camp tents provided by the Saudi Arab King­dom had not already been installed, and while the UNCHR tents were lying on the floor wait­ing to be moun­ted, I had the insane idea to visit ‘La Maison de Bresil’ (Brasil House) in order to see what was the mes­sage that one of the fast­est grow­ing and most con­tra­dict­ory coun­tries in the world had decided to trans­mit to the post-revolution Tunisia. As soon as I walked into the stand, whose size could only be com­pared with that of the Morocco del­eg­a­tions (appar­ently par­tic­u­larly close to the king, as demon­strated by their reac­tion against some pic­tures expos­ing the viol­ence that Morocco is exer­cising against Sahari people in West­ern Sahara, and by their not recog­niz­ing the exist­ence of the West­ern Sahara), I thought it was a joke. Or that I was in the wrong place. Rather than being exposed to the con­tra­dic­tions, struggles, dis­pos­ses­sions, evic­tions, log­ging, land grabbing, which are cur­rently ongo­ing in Brazil, I was received by nicely colored boards reveal­ing the beauty of the coun­try, its com­mit­ment toward a health­ier envir­on­ment, the force of the cooper­a­tion with indi­gen­ous people, and the pro­gress in terms of agri­cul­ture. All under the clear and unequi­vocal logo of Pet­ro­bras, the Brazilian pub­lic oil com­pany, the first (if not only) fun­der of the ‘La Maison de Bresil’ and the fun­der of the trans­port and accom­mod­a­tion for six­teen mem­bers of Brazilian NGOs and social move­ments, one for each part­ner of the pro­jects that Pet­ro­bras is con­duct­ing in Brazil in order to clean its cor­por­ate image. Like a post-modern Tro­jan horse, cor­por­ate power has entered the core of the anti-globalization fort­ress and has placed its sol­diers, includ­ing a couple of mem­bers of indi­gen­ous com­munit­ies of the Amazon, to dis­sem­in­ate its word and sup­port its com­mit­ment toward a respons­ible exploit­a­tion of nature and the people. How­ever, and more dra­mat­ic­ally than in the story coun­ted by Homer, it all happened with the full aware­ness of the organ­iz­a­tion, and, even more sadly, with the silent acquit­tance of the rest of the anti-global col­lectiv­ity, which has not raised a fin­ger against the cor­por­at­iz­a­tion of the WSF and refused to organ­ize sym­bolic actions of protest. To con­clude, I do recog­nize the import­ance and unique­ness of the World Social Forum as a global place where local exper­i­ences can be exchanged and dis­cussed, but I think that the cur­rent ver­sion is not what is needed to obtain a world were money is not the only driv­ing force and inequal­ity is a souvenir of the past. The polit­ical and eco­nomic rel­ev­ance of the event have trans­formed it into a bazar of pro­jects, where people spend more time selling their capa­city and their know­ledge rather than cre­at­ing hori­zontal solid­ar­ity among people and organ­iz­a­tions, nor con­front­ing their own con­tra­dic­tions (included by cov­er­ing the entire cam­pus with announce­ments and dis­trib­ut­ing fli­ers while affirm­ing that their encounter is more inter­est­ing than the meet­ing organ­ized next door). There is little doubt that this is not the WSF that I had in mind, and I am sure that this is not the WSF that many of the par­ti­cipants want and would like to rep­lic­ate in the future. For these reas­ons, it becomes essen­tial to start a ser­i­ous and deep recon­sid­er­a­tion of where we are, who we are and where we are going. 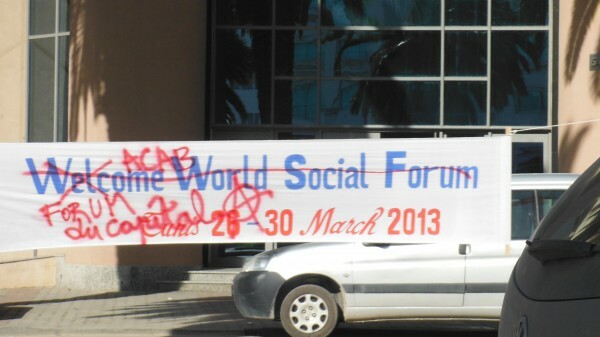 The WSF has a great poten­tial, and we can­not accept the second or third-best ver­sion that has been pro­posed in Tunis. Another forum is possible.